Firstly may I congratulate Caroline Lucas who became the first MP for the Green Party. Secondly a moan about local councils who did not print enough ballot papers to allow voters to vote. 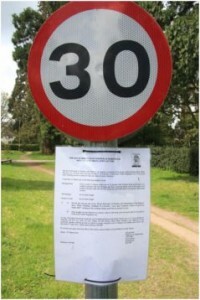 This is one of a set of speed 30mph limit signs that were erected recently reducing the limit from 60mph. Having set up the signs, another paper document was fixed below them. There is now a proposed reduction to 20mph. Naturally I wrote to the person responsible asking why it is proposed that our taxes should be spent in such a strange operation. I did not receive a reply. I have noticed a recent plethora of 20 mph signs which have been erected in towns around Britain. No doubt these were erected on behest of the outgoing government as it further hobbled our transport system during its death throws. As a regular dog-walker along that road I can vouch that speeding has never been a problem during my frequent walks.